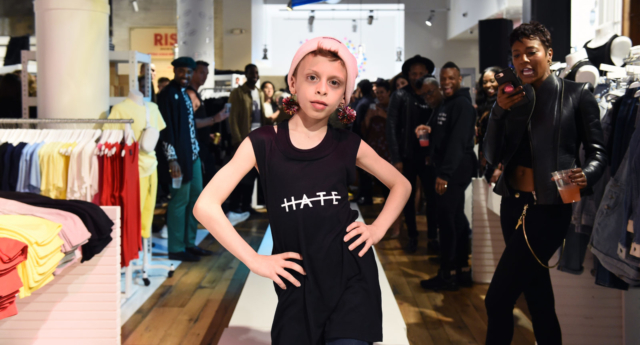 A conservative blog has taken aim at drag kid Desmond Napoles, known as Desmond is Amazing, for his activism on gun violence—but the 11-year-old was unfazed by the attack. The piece features pictures from Desmond’s Instagram account that were posted last week, taken at a fashion show/protest organised by the Gays Against Guns group in New York, which aimed to show how “ridiculous our level of gun violence is with back to school fashions reflecting our culture.” As CNN reports, there have been 23 school shootings in the US in the first 21 weeks of 2018. Desmond, who has become an icon within the LGBT+ community after first being spotted in a rainbow outfit at the New York Pride Parade in 2015, unashamedly stood by his accomplishments while condemning the publication for targeting a child. “They meant to make me look like a fool and hurt and embarrass my family. They tried to make me look crazy for protesting against gun violence in schools,” he wrote on Instagram to his nearly 90,000 followers on Thursday. “But really, they made me look even more AMAZING, even going so far as to emphasise that I’ve earned awards for my work in the LGBTQ+ community, that my career started in 2014 with @thejinkx, and that I created the term ‘drag kid.’ I mean, they ain’t lying! I’ve done ALL of those things and I’m grateful for the recognition,” he continued. “So, if you want to see what a sad bunch of adults who have nothing better to do than bully a child, call them names, and make up sexual scenarios about them, looks like, copy and paste the link below into your browser. But I wouldn’t recommend it… No need to give them any needed ad revenue,” he concluded, sharing the link to the story. RedState, which has opposed Donald Trump as a Republican candidate, is a platform largely promoting traditional Conservative values such as the Second Amendment. But it has also taken aim at Desmond earlier this year, that time lamenting the “sexualisation”of children in connection to Desmond opening the first-ever drag club just for children, named Haus of Amazing.